On a day Michael Clarke called the most satisfying of his career, Australia returned to the No.1 Test ranking for the first time in nearly five years, after the ICC’s annual rankings update. Despite not having played a Test since their series win over South Africa in the first week of March, the Australians have edged ahead of South Africa because the rolling nature of the rankings system means results from 2010-11 have now been dropped. Michael Clarke’s men also hold the top position in the one-day rankings, meaning it is the first time since December 2008 that Australia have been No.1 in both the Test and ODI formats. It is the first time since August 2009 that they have sat at the top of the Test rankings, having originally been displaced following their unsuccessful Ashes tour of England that year. The annual update means results from 2012-13 are reduced to a 50% weighting, so Australia’s home Ashes fiasco in 2010-11 and their six Test losses across two tours of India have now either disappeared entirely from the rankings or been devalued. Their home Ashes clean-sweep over the past summer and their 2-1 win in South Africa allowed them to move ahead of South Africa, who had been No.1 since August 2012, by a fraction of a point. However, Australia’s immediate reign at No.1 could be short-lived, with South Africa facing two Tests in Sri Lanka and one in Zimbabwe before Australia’s next Test series, which is against Pakistan in the UAE in October. 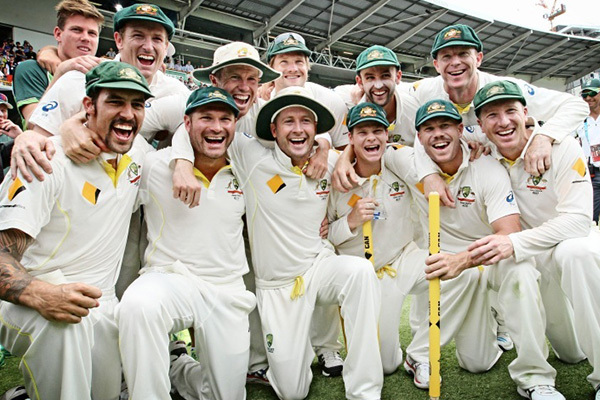 Still, the return to the top is a significant achievement after Australia slipped as low as fifth on the Test rankings in 2010 and 2011, and then went nine consecutive Tests without a win during 2013. “The last two years have been extremely positive in some ways and there’s been a number of tough times, and for a team that makes days like these even more special,” Clarke said in Sydney. “As captain of this team over the last couple of years and what we’ve been through, I don’t think I’ve had a more satisfying day or feeling in my career.